Creating characters for a comic is something that many people would love to do and although you may think it is far too difficult, it can sometimes be the easier part of the whole comic making process.Using your imagination is a huge part of the creation process, but at the same time, the only thing holding you back. You will want your character to be believable, and able to draw the reader attention to the story. The strength of the comic or story is often judged by the strength of the characters. Creating a character may take some time to ensure that it is the right one for the comic that you want to create. Although you may have several different ideas, some characters will simply not fit with this particular story. There are several different elements that you need to consider when creating characters for comics. You may think that your character is the best one that was ever thought of, however, if it becomes an illustrator’s nightmare, it may be unsuitable. One of the most common mistake for beginners is to start sketching the character without even planning on the personality, storyline or even doing any research for it.To tackle this, we have separated this tutorial into two section -“Planning” and “Designing”. The “planning” section is basically about the things that you should think of or consider before putting pencil to paper. Do not mistake the “planning” section for comic writing.The difference is that in this section, you are deciding on the characters in the comic (character creation). Comic writing is where you brainstorm on the plot, timeline, and other aspect that affects the comic as whole (how/where it starts or ends, who is involve, story development ,who lives and who dies…etc). It is best that you write about your comic storyline first and decide on the characters involved before you actually begin to plan on drawing the characters. Click HERE to know more on WRITING COMICS. Let’s begin with the most classic setup in a typical comic storyline. Most storyline in comics (and movies) usually includes these tree archetypes: the hero, the villain, and the love interest. If you are a beginner and are going through your very first character creation process, it is best that you start with creating characters for these three archetypes first. These three archetypes are characters that classic storyline focus on the most. You can then move on to other archetypes and include minor characters as the storyline expands. Archetypes are combinations of personalities and character traits that people can relate to or identify with and categorize them in groups.Archetypes act as a platform or model from where you can start your character creation process based on the characteristics.Besides the main three, there are many other archetypes that you can include as the storyline grows. You can even use the same archetypes on several different character, but be sure to make each of them unique and the characters easily remembered.Some archetypes can be used for both the good guys and the bad guys. The use of archetypes are only limited by how far your creativity goes.Here are several archetypes that pretty common in today’s comics. The protagonist, the main “guy” or “gal”. Whatever most people might call them, they all have the same recognizable trait or feature to that of a hero.Brave, selfless and willing to sacrifice himself for the greater good is some of the characteristics of a hero.You need not be a rocket scientist to figure out and start creating this archetype as it is by far one of the easiest of the group to begin with. This is because, most people have their mind set out to figuring who the hero is and in the process starts to point out the critical values of a heroic character. Therefore, it is very important to have such values in the in your hero.The typical characteristics of a hero archetype include, bravery, honesty, dutiful, selflessness and fearless. The antagonist, the nemesis, supervillain, or in simple terms the “bad guy/gal”. This archetype is the direct opposite of the hero archetype. To some, creating a villain is both fun and interesting mainly because of the near endless possibilities on what drives a character to be so evil.Their trait varies from a very troubled, mysterious entity to a very sadistic and downright evil individual. The exaggeration of how menacing the villain is can at times be necessary to show the extend of how far he will go to achieve his/her ambitions. The villain is just as important as the hero archetype and if either archetype is missed out, the role of the other will have little to no purpose in the story. The love interest represents the romance attraction or admiration of the main character.The love interest as well as the main character is almost always involved in the romantic plot/sub-plot of the storyline. This archetype represents the male/female urges or sexual desires in one character. The love interest archetype is not restricted to the main character alone and this character can also be created for other archetypes.Romantic possibilities often appears after a possible love interest is presented in the storyline. More commonly known as the supporting characters; companions/partners are characters that has a close or good relationship with the main three characters.There are several approaches to using the companion archetype in your storyline and in one example: the troublemaker.A character who always gets in trouble (hence the name). The troublemaker or the fool fit in the storyline in a confused state and is always going about with question in which at some point helps the reader/audience understand or relate to the situation or a character; depending on what the archetype was inquired about. Mentors are characters with incredible knowledge that can proves to be very helpful to the protagonist.In some case, even the villain has a mentor. “Mentoring” comes from individuals who are able to help train ,advise and share their experience with the protagonist/protege.The mentor can also acts as a support and with the vast knowledge and experience associated with this archetype, “mentoring” does not necessarily mean that it should be coming from the same person or is restricted to one character.The role of a mentor can be separated to characters with their own unique skillset and knowledge in different fields.For example: the protagonist can learn about weapons from a blacksmith, combat roles from a drill sergeant, or sorcery from a great wizard.The blacksmith, drill sergeant as well as the wizard has their own expertise and knowledge making them a teaching figure for the protagonist. This archetype is commonly associated with deception and even betrayal.Trickster characters are well known to cast doubt in the minds of others and almost always go for the side that benefits them the most.This is what makes the trickster character stand out from the rest.The trickster can sometimes be an equal to both the protagonist as well as the antagonist and their perception or action could lead them to becoming the unlikely hero or a “scene stealer” which also has its downside.This archetype challenges the perspective of the others including the protagonist/antagonist.The trickster is also able to convince their decision into the ones that favor him/her the most.If done right, a single trickster character’s influence could affect the cast of characters involved or even the entire storyline. Creating a female character? Check out some ideas here. These are several basic archetypes that most are familiar with.You can always try to combine multiple aspects of different archetypes and combine them in a singular character.This can lead to making a very complex and unique character but if not done properly, can also confuse readers and make the storyline hard to follow.You must also keep in mind that it is not necessary to get each and every different archetype into your story.Too many characters with different archetypes or roles can often confuse the reader, complicate the plot or worst; you risk having overlapping roles with the characters involved (no one stands out from the group). Some archetypes fits perfectly in certain storyline, while others do not.This is why you should refer to when you were creating the storyline and deciding on which character was involved.It is always good when you think of new ideas for a character, but this can also interfere with what you have planned before. Everyone has their own approach towards character creation.Some start by planning the character and design them before they write the storyline. There are also those who writes the storyline first before they plan on the character.we recommend writing the story first before you begin with anything else. The problem with planning and designing your character first that you always go back to redesigning on the character because of the changes you make once you start writing the storyline – and this always happens.Although this may look like a small problem, it is time consuming and it is possible that you risk ruining the initial idea of your character when you continue to go back and forth in redesigning. By writing the storyline first, you will be able to proceed with planning your character based on the setting and plot of the storyline. This also helps you avoid straying too far off from the original character concept and design based on the storyline. To learn more on writing storyline for comic, visit the Writing Comic page Here. There is plenty of inspiration around you every day when creating a character for a comic. If you enjoy people watching, you will be able to adapt everyday situations, and people to the characters that you are trying to create. If you find yourself out of ideas or simply cannot think of anything for a character, you can try to do this instead. With a notebook and a pen, take a walk to a public place for example: a coffee shop, a bus station, or a shopping center. Find a comfortable place to sit or relax and have a clear view of the surrounding. This quote alone can help you get ideas for a character or even a great storyline/plot. You do not need to be a psychic or a shrink to do this or approach everyone and talk about their lives.Personality wise, the quote in a way tells us that everyone has their own characteristics or habits and you can actually tell how it is so by how they walk, their body language, the way they talk, even down to how they look at other people or how they hold their cup of coffee.It is in these people’s behavior that you can get tons of ideas from. Write down what you think you can work into a comic character(You can take pictures of it but these can make the other party uncomfortable and possibly upset them ). Try to get a behavior or habit that stands out from the rest.The reason to this is that you are actually gathering resources of characteristics and traits from real people to influence you in creating characters.The way you interpret or translate what you saw is the main ingredient in this.This is because you are seeing it from your point of view and anything that you think of from it comes naturally from you, which makes it YOUR IDEA! We are not encouraging you to stalk that one person all the way back home and document every single thing he or she do.Just write down what interest you then and there.Try to get several different characteristics or traits from several different people around you. If someone catches you doing this and asks, tell them that you are researching (yes, you really are researching) on characteristic for a comic character you are working on and ask if they know of any good ideas.Most would be more than happy to help and some gives out crazy ideas that can actually be quite interesting. Although it can be difficult to totally ignore other famous comic characters but unfortunately, you have to try to do so. The moment that you begin creating characters that look, and act like other comic characters, people will slowly start to lose interest. Basing your characters on people that you know or came into contact with is an unique way of creating a character for your comic. When you have begun to create characters, you will find that the ideas are free flowing, and writing them all down can be a great way to ensure that you do not forget anything important. Brainstorming is ideal, and can be done anywhere at any time of day, or night. You may find that you cannot sleep, and are up writing down new ideas on creating characters. Although you will never use all the ideas, you will be surprised at the number of great ones that appear. Analyzing all your ideas will be far easier if they are all written down. Creating a character is a very inspirational process, and one that can be a great deal of fun. Superheroes and Beyond: How to Draw the Leading & Support Characters of Today’s Comics comes from a best-selling author of drawing and cartoon books and provides step-by-step instructions on how to develop characters as well as draw them. 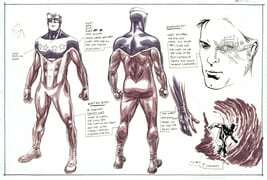 From the use of light and dark and foreshortening poses to superhero dynamics and action, this goes far beyond your typical ‘how to draw comics’ approach. Stories and characters are a lot like recipes and ingredients: when they work together they can make a greater whole-Bryan gets this concept and it is evident in this easily digested book. A must-have for anyone trying to gain a more comprehensive understanding of what goes into character design. I think this is a fantastic book for beginners. The poses alone are great as quick reference for simple drawings. The topics are educational, informative and easy to understand. A wonderful book for any beginner, even intermediate artist to add to their library.